As I’m sure you know, hassles often extend beyond the PC. For example, if you have young kids, it’s a sure bet they’re always clamoring to use your Android smartphone. And with so many great games, children’s books, paint programs, and other apps, a smartphone can be the ultimate sanity-saver for a harried parent. But here’s the hassle: Kids too young to master the intricacies of a mobile operating system can inadvertently wreak havoc, whether it’s dialing your boss at home, deleting important data, or spending a small fortune at the Google Play store. Enter Play Safe, a new app that gives your kids a sandbox in which they can play, well, safe. Specifically, it provides a friendly front-end for a hand-picked-by-you selection of apps. When you want to give your young one a turn with the phone, you just run Play Safe, then rest easy in the knowledge that he or she won’t be able to do anything but run the apps you’ve sanctioned. 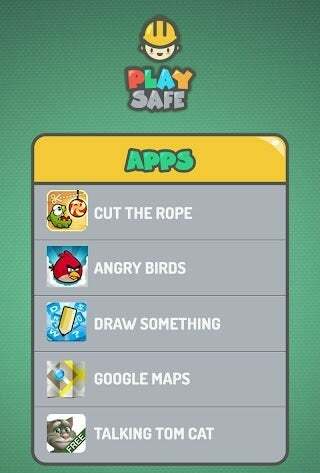 When the time comes to exit Play Safe, you simply hold down the app’s logo for three seconds. Older kids might be able to figure this out, which is why the developers will soon be adding password protection. If you want to give your kids some play-time with your phone, Play Safe offers a free and easy way to protect your apps and data. Now you just have to figure out how to keep them from dropping it.